A book that explains a lot..
My sister recommended this book to me, and it was good to know that I’m not alone out there…. 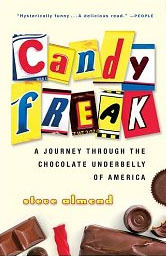 Candy Freak by Steve Almond (seriously, that’s his name) is a great tale of one man’s obsession with candy. Full of humor and nostalgia, he details his early years through the present. He swears he’s eaten a piece of candy every day. That is true discipline! He toured candy makers across the country and writes about their products and process. He even visited the Owyhee toffee factory in my state of Idaho. He used all of this information to write his book, but I think the real purpose of his travels was free candy. It’s brilliant!